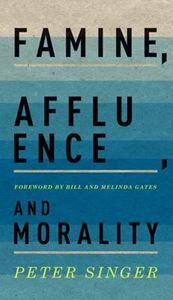 Quick overview As Bill and Melinda Gates point out in their Foreword, Singer's classic essay "Famine, Affluence and Morality," is as relevant today as it ever was. In 1972, Peter Singer published "Famine, Affluence and Morality," which rapidly became one of the most widely discussed essays in applied ethics. Through this article, Singer presents his view that we have the same moral obligations to those far away as we do to those close to us. He argues that choosing not to send life saving money to starving people on the other side of the earth is the moral equivalent of neglecting to save drowning children because we prefer not to muddy our shoes. If we can help, we must-and any excuse is hypocrisy. Singer's extreme stand on the standard of giving has become a powerful topic of discussion in modern philosophy and continues to challenge people's attitudes towards extreme poverty. As Bill and Melinda Gates observe in their foreword, Singer's essay is as relevant today as it ever was. This short edition provides a valuable collection of the original article, two of Singer's more popular writings on our obligations to those in poverty and a new introduction by Singer that advances the topic with his current thinking.